Winter Park Resort received the most snow in November since 2005. Despite a warm October that postponed opening day for some resorts, Colorado’s current ski season launched in mid-October as a crowd of overjoyed skiers and snowboarders made their first turns at Arapahoe Basin Ski Area. It was the first ski area to open in North America for the 2014-15 season and, for the third year in a row, the first in Colorado to open. Nearby Loveland Ski Area became the second to open this season when its lifts begin turning Nov. 1. It was the resort’s first November opening since 1992. The warm, dry weather caused Copper Mountain and Keystone Resort to push a planned Halloween opening to Nov. 7. By mid-November, however, several storms and some very cold temperatures allowed the resorts to make up for lost time. Open resorts were able to make more terrain available to skiers and riders and others were able to start the season on a positive note. Breckenridge Resort opened Nov. 14 with 30 inches of fresh snow followed by Winter Park Resort on Nov. 15. By Nov. 27, Winter Park—which is celebrating its 75th season—reported it had received 68.5 inches of snow, the most to accumulate at the ski area in November since 2005. Winter Park’s popular Mary Jane Territory opened Nov. 28. Eldora Mountain Resort opened with several runs and four lifts running on Nov. 21. Many called it one of the best opening days ever at the mountain near Nederland. By Dec. 1, all of the state’s major resorts have begun their seasons. With snow and cold covering the region during the final week of November, and more snowy weather forecast into December, resorts will continue to open more terrain while those still set to open should kick-off the season with plenty of snow. Sunlight begins the season, Dec. 5 while Ski Granby Ranch and Powderhorn are set to open Dec. 11. Buttermilk and Ski Cooper expect to open Dec. 13 and Silverton Mountain gets going on Dec. 20. Following a record year for skier visits in Colorado, and a summer of major upgrades and improvements at regional resorts have snow enthusiasts, as usual, looking forward to the season ahead. Colorado’s ski areas are aiming to build on last year’s successful season with capital improvements, program upgrades, and new technology. “As always, Colorado resorts are focused on delivering a great guest experience,” CSCUSA President and CEO Melanie Mills said. 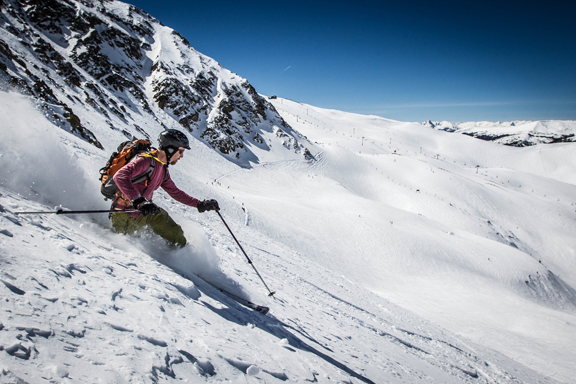 Arapahoe Basin, which hits high on the Continental Divide, was the first ski area to open in North America. Arapahoe Basin unveils a new Kids Center in spring 2015. The $2.3 million, 7,000-square foot building between the Black Mountain Express lift and Rental Shop is home to kids’ snowsports lesson and program check-in, kids’ ski and snowboard rentals, and a snowsports dining area, as well as the A-Basin Ski Patrol First Aid Room. Arapahoe Basin is also making its Molly Hogan Learning Area more accessible. “We’ll be shortening the lift and also moving it closer to the Molly Hogan lift to make our learning area even easier to navigate,” Isaac explained. There is also a new fleet of rental clothing from Marker and demo skis and rental boots for adults from Rossignol. Echo Mountain, located at the former Squaw Pass Ski Area between Evergreen and Idaho Springs, was bought by current owner Nora Pykkonen in 2012. It is home to the Front Range Ski Club, a members-only alpine ski racing facility. The ski area prides itself on taking an innovative and progressive approach to “developing alpine athletes fullest potential” and is “100 percent focused on becoming the premier alpine training facility in the United States.” Since Echo Mountain is a private center located at 10,500 feet, it controls snowmaking, grooming and terrain construction to optimize the development of competitive alpine ski racers. Among other upgrades, the facility is opening a new Nordic trail to the public later this season. For 2014-2015, Eldora Mountain Resort added two new Kassbohrer grooming machines to its existing fleet of five. Combined with 100 percent snowmaking coverage on all groomed territory, the new grooming machines improvement will ensure a consistently high-quality snow surface for all ability levels. Ski Granby Ranch, located 20 miles west of Winter Park, is a family-owned ski resort designed for skiers and riders of all ages and abilities and is one of the few ski areas to offer night skiing. This year, Granby Ranch reopens its Poma lift, providing access to the Lone Pine Bowl for the first time in more than 15 years. An old-west-themed kids’ trail, tunnel and covered bridge have also been upgraded. This season, Ski Granby Ranch added two new expert-level black trails on West Mountain and a new trail on East Mountain to provide beginners with easier access to the base area. A new green-level glade opens tree skiing and riding to beginners while Dean’s Glade has been newly improved with grading and thinned trees. The ski area also offers additional ski and ride school options this season and, in partnership with K2, has added a total of 200 adult and junior skis and 75 pairs of snowboard boots. 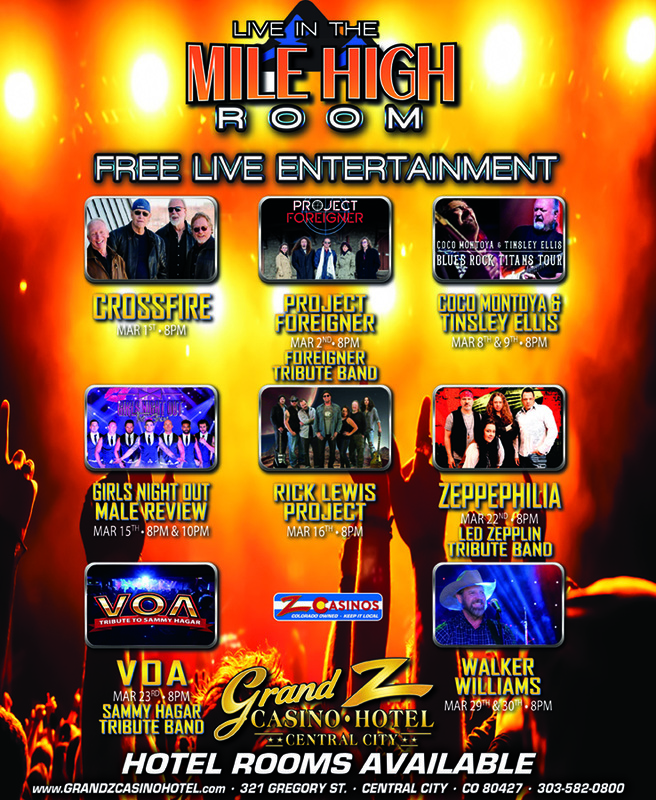 The resort has also added a apres-ski party series and other events. This season, Loveland Ski Area near Georgetown has invested in snowmaking upgrades at Loveland Basin and Loveland Valley. It has also opened the new Ginny Lee Cabin, a day-use, on-mountain structure providing skiers and riders on the north side of the ski area a convenient place to meet friends and warm up without a trip to the base area. The new warming hut is located off Chair 8 and, according to Marketing and Communications Director John Sellers, offers “incredible” views along with restrooms and vending machines. Loveland has also added a second Magic Carpet surface lift at Loveland Valley. It is open to the public and provides access to gentle terrain for first timers. At Loveland Basin, a newly remodeled cafeteria was unveiled this season. The remodel makes it easier and more convenient to dine. “The new layout and additional menu items have been very popular so far this season,” Sellers said. Winter Park Resort celebrates “75 Years of Imagining More” with a 75th Anniversary party that will last all winter long. In addition to its anniversary, Winter Park is also hailing its largest on-mountain building construction in more than 25 years. Lunch Rock Restaurant is a state-of-the-art facility utilized year-round, with 150-seat heated deck, 250-seat indoor restaurant, bar, and hydration station focusing on Colorado themes. At 16,000 square-feet, the new restaurant is over five times larger than the previous structure, which was built in 1985. In addition to convenience and comfort, at 11,200 feet in elevation Lunch Rock Restaurant will boast amazing views of Parry Peak, James Peak, Parsenn Bowl, the Fraser Valley, and the Continental Divide. “It’s pretty spectacular,” Director of Public Relations and Communications Steve Hurlbert said. 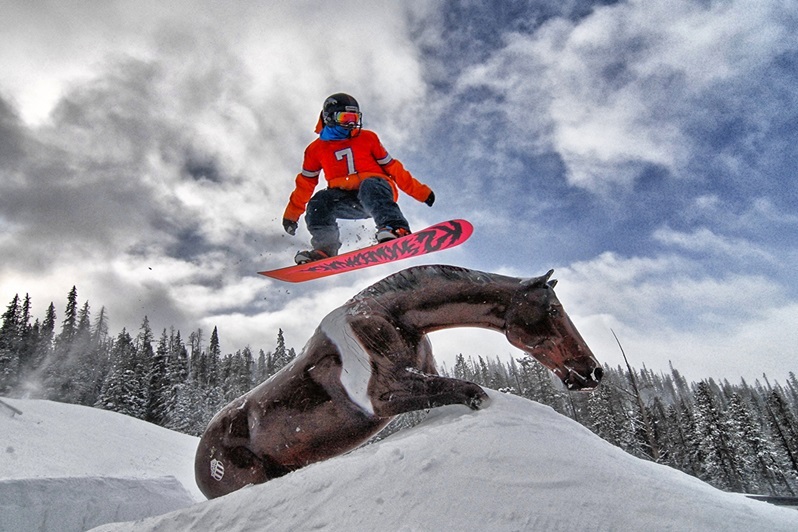 Watch for 75th Anniversary events throughout the season including a 75th Anniversary Gala at The Lodge at Sunspot on Jan. 24, 2015 and a Winter Carnival, Feb. 7-15, with anniversary–related activities each day. No matter what or where you ski or ride, enjoy the new season and everything our regional resorts have to offer. Tags: 2014-2015 Ski Season, Arapahoe Basin, Echo Mountain, Eldora Mountain Resort, Loveland Ski Area, Ski Granby Ranch, Winter Park Resort. Bookmark the permalink.